One of the best things a company can do for itself and its local and/or global presence is to become smarter about the way it uses, tracks and communicates its energy consumption. Making these changes not only reduces environmental impact by limiting energy waste, but it also strengthens the company with real measurable cost savings as well as the potential for an enhanced public opinion of the organization. But what is the best way to orchestrate an efficient plan of action for your organization? In the first part of our series, we’ll discuss a simple but effective 5-step plan that organizations can implement and show how companies like yours can use Periscope software to help visualize progress and measure goals. Upon deciding that you want your organization to become more energy efficient, begin with taking stock of how your facility currently uses energy. Walk around to understand where energy is used and wasted. What sort of lights are installed in and around your building? Does your facility use incandescent, fluorescent, or LED bulbs? Do computers tend to stay on all the time even when no one is in their office? Are thermostats secure and configured around occupancy and usage patterns? These are just a few basic questions that could be answered quickly to get a general idea of where energy savings might be available. Many utility providers will provide weather-normalized energy usage reports for a more detailed picture of your consumption. Entering your building’s consumption in ENERGY STAR’s portfolio manager will rank your building’s site and source energy usage intensities against other similar peers. Instead of just reviewing monthly data, a more specific next step could include a site-specific program like Periscope Dashboard. Periscope lets you read energy consumption data automatically gathered from digital controls, and metering hardware in your building. Over time you can get a detailed time specific graph of when and how much energy (electric, heat, oil, gas, fuel of all types) your site is consuming. Using “viewlets” like the Baseline Comparison will tell you quickly where you were (baseline) vs. where you are now by comparing two periods of a given trend. “Is my building consuming more energy compared to yesterday or this same time last year?”. After a baseline has been established, you’re ready to set goals. You don’t want to set goals that are unreasonably challenging from the start. Picking obtainable goals and meeting them will not only prove to yourself, but also your employees or coworkers that sustainable measures can be achieved. It also gives you a sense of accomplishment and creates a new goal to strive to surpass. Start going through your initial list of items you found that could be improved upon. Lights on in empty rooms? Make it known that they don’t need to be on and add occupancy sensors. Electronics that are not being used but still plugged in will have ‘phantom drain’ and use electricity. Unplug devices that are not needed, or schedule switches off. If your heating or air conditioning systems run all the time, search and fix potential air, water or steam leaks. Establish a recycling program if one isn’t available. Simple things around the office can be done that cost little to nothing and make a big difference. With Periscope, you can broadcast your sustainability initiatives to everyone working or visiting the building using a series of customized Green Tips running on a kiosk TV in a heavily trafficked area. This can help educate and motivate everyone to make a difference. Once you’ve implemented all no-cost/low-cost optimizations, prioritize ideas considering actual savings, education, and cost. If you’ve set aside a budget to make energy-saving improvements, determine what the most beneficial would be to your company. ENERGY STAR lighting and appliances? Smart thermostats? Solar panels? Sustainability improvements can vary in upfront cost from free to expensive, but many will have a return on investment. Each month ask your utility company for detailed monthly usage and cost. Use Periscope to compare year over year and summarize whether goals have been met. If they have, great, keep going! Let managers and staff know that they’ve done well! Incentivizing success with monthly or annual prizes to top energy reducers is a great way to have repeated success. 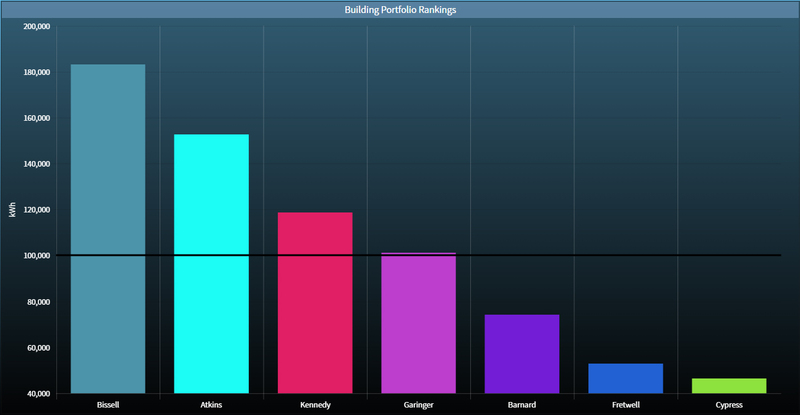 The Periscope Ranking Chart Viewlet is a great way to compare different floors or different facility types across campus or office sites to make these competitions fun and engaging! If goals or objectives have fallen short, use this knowledge to understand the need for additional improvements or where to target tenant engagement moving forward. Perhaps you were overly aggressive and should re-evaluate your initial goals. Were they too optimistic for the timeframe you established? Small steps are better than no steps. Once you’ve automated a way to review usage and savings, it’s easier to keep up with and share the results of your sustainability initiatives. Come up with a schedule that works for your team to evaluate progress and make adjustments accordingly. Tracking energy use doesn’t have to be difficult and Periscope makes it easy to review it in a timely manner and streamlines the communication amongst your team. Tracking the energy usage on your campus or building on a consistent basis can also help identify other issues such as equipment failures, or comfort standards that have been overridden. Anomalies will be readily apparent in the proper visualization. By having an established building dashboard, you’ll be able to identify and correct the issue before significant monetary and energy usage setbacks have occurred. For more helpful information on how to use less energy and become a good steward of the planet by reducing consumption, take a look at the International Standards Organization ISO 50001 Energy Management guide or give Activelogix staff a call. Next month for Part 2 of our discussion, we’ll take a deeper dive into how Periscope can find energy leaks at your site, and how to best optimize your system. See you then!